Without a doubt, Carcass has influenced and been responsible for much of the melodic death metal scene. With killer riffage, the inspired vocals and lyrics of murder and gore, as well as melody balanced with brutality, there is no way one can deny the influence this band had on the ones that would follow. While they started out as Grindcore pioneers along with Napalm Death, the band transmogrified their sound over their existence until they hit upon something that would become the basis for the melodic death metal that would follow. 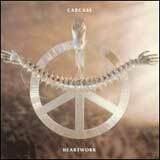 Just as Heartwork was released, In Flames, Dark Tranquility, At the Gates, Edge of Sanity and Hypocrisy were beginning to breakthrough. Slaughter of the Soul and The Jester Race were right around the corner. This album without a doubt culminated everything that Carcass was capable of. Starting off with “Buried Dreams, ” they give us a shot of Jeff Walker’s gravely vocals and the first real doses of metallic song structure and melody on a Carcass album. While the band eventually disbanded because they thought that they had strayed from their original view, I would take this album over any of the grind they released earlier. There is something about a Michael Amott solo that I like a lot more than “Genital Grinder.” Amott is also one of the keys to this album. You can clearly tell that this band was the precursor to Arch Enemy. So much of the music sounds like early demos for what would become Stigmata and Black Earth. On the title track, for example, we hear an up-tempo riff with dual guitar battling and the, in my opinion, perfect vocals for this kind of music. Walker, Steer and drummer Ken Owen really understood that adding Amott to the band would be a vital asset and help their music advance to the next level. His musical style was vastly different from grind, and it is he who probably improved the music by using conventional song structure on this album. One of my favorite tracks has to be “This Mortal Coil” in which we get a nice helping of blast beats and mind-twisting breakneck guitar shredding. Walker again suits his vocals to each turn the music takes. The next track “Arbeit Macht Fleisch” is a shredder from start to finish that clearly has Amott’s name spray painted all over it. Each aspect of this complex melody shows some homology to work he has done later on in his career. The final track also even incorporates a little of the folk influences that seem all too common in metal today. It is good to see this influence but in a subtler role than it is featured today. You almost have to define your sound with folk influence if your band hopes to advance in certain aspects of the scene now. Carcass shows how it can be evenly balanced with a full-on metal attack. The gore themes have been dialed down a notch from previous Carcass releases. Instead of over the top almost parodical nonsense lyrics, it seems as though the band focused on the real message behind the senseless vulgarity and created something more spine tingling and creepy. Instead of another “Embryonic Necropsy and Devourment” we get “No Love Lost.” This refinement in terms truly elevated Carcass above anything they had ever done before. The album artwork by famed Swiss Sci-Fi artist H.R. Giger is also a step above their previous artistic themes. When writing this review, I was constantly thinking of ways that this album played a vital role in the metal world. Then I guess I found the best example of this by accident. Right next to Carcass in my iPod is Carnal Forge, a band whose name is quite possibly derived from the second track on this album.